It's so cold! I am freezing my little tootsies off. 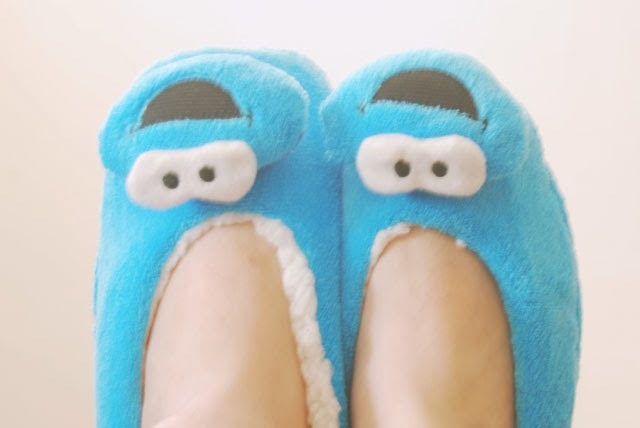 Luckily, I have these amazing Cookie Monster slippers from Primark. I have quite the affinity with Cookie Monster as he was the subject of an in-joke with a uni friend back when I was an irresponsible teenager! These slippers are so soft and so fluffy. They're all fleecy inside and out so they're super snuggly. Teamed with my fleece strawberry onesie, I'm in cosy heaven! Primark is the best for slippers! Ah these are so cute! I love being able to snuggle up in cute and cosy things when it's cold. These are so adorable. I think I need to get that strawberry onsie!